Professor Zhenan Bao and her team at Stanford University evidently do not shy away from grand challenges, for they have just published in the journal Nature Nanotechnology the results of their quest to create a revolutionary new kind of ‘plastic skin’ that can not only sense touch, temperature and pressure, but also repair itself at room temperature. 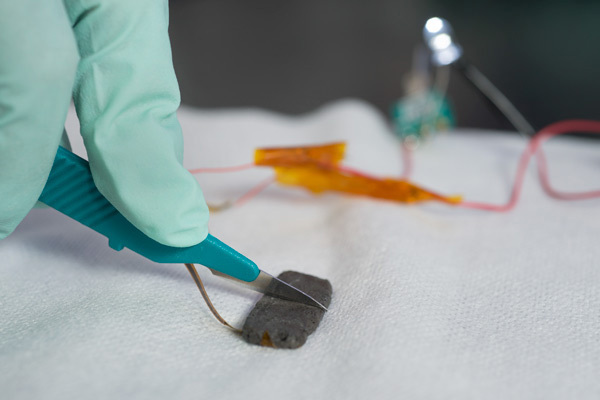 The self-healing synthetic material could pave the way for better prosthetics and, because it can also conduct electricity, could lead to the production of electronic devices or electrical systems that would be able to self-repair certain kinds of damage. Bao told Stanford News that although significant advances have been made in recent years in the development of synthetic skin, their self-healing properties were up to now dependent on particular conditions such as extremely high temperatures, making them impractical for regular use. For those synthetic materials that could heal at room temperature, they could do so only one time, as the repairing process altered their mechanical or chemical structure. To achieve its goal, the team first created a resilient polymer consisting of long chains of molecules linked together by hydrogen bonds. To this the scientists added tiny nickel particles, making the material conductive and improving its mechanical strength. To test its ability to repair itself, the scientists simply took a piece of the material and cut it in half. Holding the two pieces close together, they discovered it took only a matter of seconds to regain 75 percent of its original strength and conductivity. In just half an hour that figure was just shy of 100 percent. “Even human skin takes days to heal. So I think this is quite cool,” Benjamin Chee-Keong Tee, a researcher on the project, told Stanford News. Tee said the material’s sensitive qualities make it able to feel the pressure of a handshake, opening up the possibility of it one day being used in prosthetics. It added that other commercial possibilities could involve wires of electrical systems which, if coated in the new material, would be able to self-repair after being damaged, making it ideal for locations such as inside building walls or vehicles, eliminating the need for potentially expensive maintenance work. And If the team can succeed in its aim to make the material transparent and stretchy, smartphones and the like could be wrapped in the special ‘skin’ to help protect them from damage. Researchers from Harvard have found a way to make its snake robots faster. The secret? Using a Japanese paper craft called kirigami to better grip the ground, just like a real snake's skin. You may not want to drop a bunch of cash on a new mattress, but with a good mattress topper, you may not have to. Modern technologies make it easier to get a good night's sleep, and we've rounded up the top 10 mattress toppers you can buy.